Published: Nov. 1, 2015 at 11:30 p.m. Updated: Nov. 3, 2015 at 12:51 p.m. The waiver wire is one of the most important keys to finding success in the world of fantasy football. I'll do my best to help you manage the waiver wire to scoop up the players who can help bring you fantasy glory each and every week. If you play in a deeper, more competitive league, and all 15 of these players are already owned, be sure to check out my weekly "Deep Dive" waiver wire column (published Mondays), for some high-upside players to aim for heading into Week 9. The Cardinals, Texans, Lions, Ravens, Chiefs and Seahawks are on their bye week, so plenty of owners will be looking for spot starts this week. Some of the players below will certainly fit that bill. For more specific FAAB questions, hit me up on Twitter. Williams is still pretty highly owned in NFL.com leagues, but Le'Veon Bell owners or those in desperate need of a running back should make put in a claim for the former Panther. The 32-year-old running back racked up 110 total yards on Sunday in relief duty and is averaging 4.9 yards per carry on the season. NFL Media insider Ian Rapoport reported on Sunday night that the Steelers fear Bell has a badly torn MCL and will be done for the season. That puts Williams back onto the RB1-2 radar with Big Ben back under center. 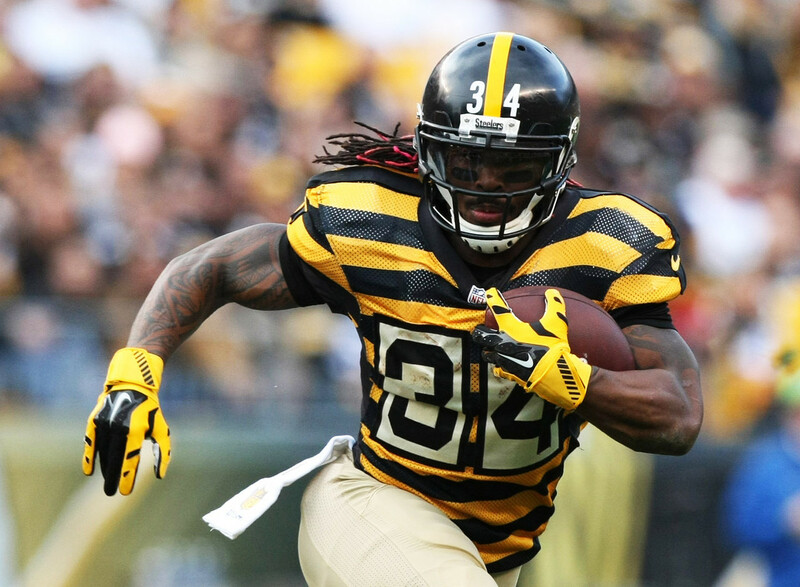 After all, Williams was fantasy's highest scoring running back after the first two weeks of the season while Bell served his suspension. FAAB suggestion: 20-25 percent. Last week, I was surprised by how low Snead's ownership percentage was, and despite pleas from Matt Harmon and me, more people actually dropped Snead heading into Week 8 than added him. The Saints offense got back on track this week in a good matchup, with Snead catching two touchdowns in the process. He's going to be a WR3 every week moving forward, and has been the most consistent wideout on the Saints in real life, and in fantasy. He'll face the Titans next week, who appear in free fall mode after losing to the Texans this week. He will have WR3/flex appeal. FAAB suggestion: 5-10 percent. Reed was on a bye this week, which means he could still be sitting on some waiver wires after returning from a string of injuries. When Reed has started and finished a game this year, he's finished as a top-12 scoring tight end each time. That's remarkable consistency at one of fantasy's most volatile positions. He'll face the Patriots next week, who have been brutal on tight ends (only 5.53 fantasy points per game allowed on average), but with the volume of targets Reed gets (27 percent in his four completed games) he'll have plenty of chances to buck that trend. He's also just a pure matchup nightmare, with size and speed that make him difficult to cover one on one. FAAB suggestion: 15-20 percent. In what was one of the worst injury-riddled weeks I can ever remember, Bears' superstar running back Matt Forte suffered what is believed to be an MCL injury, but we won't know for certain until the team can perform more tests. MCL injuries are typically of the multi-week variety, which puts Langford on the radar as one of the week's top pickups. Langford received 10 of his 12 carries after Forte left the game with his injury. He'll figure to be the workhorse next week when the Bears take on the Chargers, who have been gashed by the run for much of the year. Forte owners will want to make sure they scoop up Langford to weather the storm until their RB1 returns. FAAB suggestion: 20 percent. Seferian-Jenkins is coming back to the Tampa Bay offense at just the right time. His quarterback is progressing, and at the moment lacks dynamic options in the passing attack aside from Mike Evans. ASJ also gets to face the Giants, who have been one of the worst teams in the NFL at covering the tight end position. They've given up 684 receiving yards to the position, the worst mark in the NFL and over 100 yards more than the next closest team. And their FPA would look even worse had Kirk Cousins and Jordan Reed connected on their two red zone targets back in Week 3. And let's not forget that Jameis Winston has a history of targeting his tight ends a ton dating back to his days at Florida State. All told, ASJ is eyeing a return to the every-week TE1 discussion and needs to be grabbed off of the waiver wire immediately. FAAB suggestion: 15-20 percent. Davis fell off the fantasy radar as he was stuck in the quagmire known as the 49ers offense, where he hadn't scored a touchdown since Week 1 ... of 2014. Now that Davis will be joining the Broncos, he merits consideration on the waiver wire. Davis is still a talented pass-catcher who has also recorded the fastest speed among tight ends in 2015, according to our Next Gen Stats. Tight ends have thrived in Gary Kubiak's offenses in the past, and Davis could provide a nice short-range security blanket for Peyton Manning as the weather turns colder and his arm gets weaker. Davis isn't a candidate to join the elite TE tier, but at such a volatile position he is worth an add over struggling "sleepers" like Zach Ertz and Jordan Cameron. The team wouldn't have traded for him if they don't intend to use him over the aging Owen Daniels and average Virgil Green. FAAB suggestion: 5-10 percent. Eddie Royal left Sunday's game with a knee injury, which could pave the way for Wilson to once again play a more prominent role in the offense. From Week 4 to Week 6, Wilson racked up 219 receiving yards and a touchdown while Jeffery was out and Royal was battling injuries. He's a talented young wideout who will need volume to produce, and that's exactly what he could see next Sunday if Royal misses the game. Add in the fact that the Bears are playing the Chargers, and Wilson enters the WR3/flex discussion as a nice spot start. With six teams on their bye in Week 9, Wilson will have value. FAAB suggestion: 5-10 percent. Since his Week 6 bye, Carr has thrown for 622 yards with seven touchdowns and zero interceptions, notching more than 20 fantasy points in each game. He just roasted a Jets defense that was considered among the league's best, and more playmakers are emerging in his offense each week. Next week, Carr faces the Steelers who have been playing better of late, but can still be taken to task through the air. Carr will be an excellent streaming candidate with six teams on bye weeks. I also like his upside for the rest of the season, too, as he's playing great football of late. FAAB suggestion: 10-15 percent. Cobb makes the list again as he'll finally be able to return to the field next week. The rookie practiced last week, and with the Titans backfield still searching for an identity, he has a chance to come in and provide a spark. It'll be tough to start him right out of the gate without any idea of how many touches he might receive, though. Still, Cobb is coming into a situation where he could emerge a season savior for fantasy owners down the stretch, akin to Jeremy Hill and C.J. Anderson last season. A lot will need to go right for him to hit that level, but fantasy owners will want to stash him in case he gets on a roll. FAAB suggestion: 10-15 percent. It's a sad day for fantasy and football fans in general, as Steve Smith suffered a season-ending Achilles injury. The Ravens will need someone to step up in the passing attack, and the most likely candidate is Aiken. He's been productive when he's seen enough volume this year, as he's averaged 9.65 fantasy points per game when he's seen at least seven targets. The Ravens head into their bye this week, which makes Aiken a nice stash candidate. He faces the Jaguars in Week 10, who have allowed over 23 fantasy points per game to opposing wide receivers in 2015. FAAB suggestion: 5-10 percent. Austin has improved as a player this year, but is still limited by the overall production of his offense. Still, he's scored more than 20 fantasy points twice since Todd Gurley started punishing opposing defenses and opening up more space for Austin to roam. He'll have up-and-down weeks, but will be a nice matchup-based starter as a WR3 or flex. The Rams have finally found some ways to unlock Austin's undeniable talent and athleticism, and it's time fantasy fans got in on the action. FAAB suggestion: 5-10 percent. Watson has seen at least five targets in four straight games now, hitting double digit targets in two of them. He's scored three touchdowns in the last four weeks, and has crossed the century mark in yardage twice, each time setting a new career high. The Saints passing offense is heating up lately, and the emergence of Benjamin Watson could be part of the reason why. He's worth an add as his production is pretty consistent among tight ends. FAAB suggestion: 5-10 percent. Washington heads into his bye this week, but has quietly been on a bit of a tear in fantasy, with 201 receiving yards and three touchdowns over the last two weeks. Washington has now scored double digit fantasy points in three of the four games he's started and finished, which makes him an intriguing add as he heads into his bye week. He'll face the Bengals defense in Week 10 which will be a good test to see if his last few games have been a fluke, or a flash of what's to come. FAAB suggestion: 5-10 percent. Like Washington, Floyd is heading into his bye week on a tear in fantasy, having notched at least 50 yards and a touchdown in three straight weeks. He, John Brown and Larry Fitzgerald form one of the league's top pass-catching corps, and it seems as if there will be enough targets to go around for all three of them to eat in fantasy. Floyd's big day in Week 8 (106 yards, TD) did come partially because the team essentially rested Brown so his hamstring could heal, but Floyd's playing time increased over the last several weeks now that he's fully healthy from his offseason hand injury. He'll be on the WR2-3 radar moving forward as a prominent piece in one of the NFL's top passing attacks. FAAB suggestion: 10-15 percent.